On October 5th, a pig trailer carrying over 160 pigs rolled over outside of Fearmans slaughterhouse in Burlington, Ontario. At least 40 pigs died and many others were left badly injured. Members of Toronto Pig Save rushed to the scene to document and offer assistance and sanctuary to the injured pigs. The response of police and slaughterhouse workers was callous and cruel, with many seen laughing at the struggling, bloodied and injured pigs. Rather than helping the pigs or enforcing animal cruelty regulations, the police choose to arrest one of the activists – Anita Krajnc, with three officers attired in tactical gear throwing her to the ground and handcuffing her. 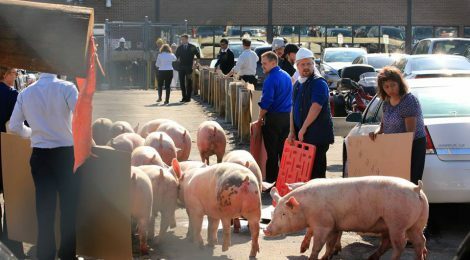 The Canadian Food Inspection Agency – the body charged with enforcing animal transport regulations – showed up briefly but left after just 10 minutes. The Ontario Society for the Prevention of Cruelty to Animals, despite many calls, failed to show up completely.